Today, let’s have a little fun with the reverse-proof Two Pounds Britannia Coin telling the humorous story of a visit to the Queen’s Garden Party 55 years ago. Editor’s Note: UPI correspondent China Altman was assigned to cover Queen Elizabeth’s garden party at Buckingham Palace Thursday. She asked for 35 shillings ($4.90) expense money because she did not have a hat to wear. She bought the hat at a department store. It was a smashing success. Prince Philip said so. London (UPI) My stiletto heels were sinking into the lawn of Buckingham Palace and Prince Philip was coming my way. But then he also was coming the way of about 2,000 other persons invited along with me to her majesty Queen Elizabeth’s garden party. We had formed three massive human lanes underneath the stone cherubs and fish and things that adorn the huge back wall of the place. The Queen, the Queen Mother and the Prince each picked a lane to walk down. I was intent on balancing with my long blue umbrella as my white pencil-thin heels disappeared into the soft turf. “What a stunning hat boomed a deep voice directly in front of me. I looked up into the big smile of blond Prince Philip. The heels seemed to plunge another 10 inches into the lawn. But I smiled, dear everyone at home in America, I smiled. “How in the world do you keep it in place?” he asked, pointing at my hat, which consisted simply of one glorious huge blue rose with a black veil that covered my face. Then, since he seemed so friendly, I blurted out the question that had put me and about 20 of my friends into a state approaching panic. “Do you think I’m correctly dressed for the Queen’s garden party?” I asked. “My dear, you look lovely,” said the Prince with a bigger grin than ever. It always rains at Queen Elizabeth’s garden parties. Then swinging his own black cane-handled brolly he walked on. Oh dear, I thought, I forgot to curtsey. But the duke didn’t seem to notice, or mind. 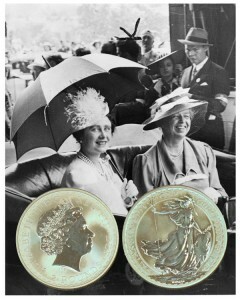 The reverse-proof Two Pounds Britannia Coin shows with a picture of Queen Elizabeth, the wife of King George VI and the Queen consort of the United Kingdom and the British Dominions, holding an umbrella sitting in a car with Eleanor Roosevelt, circa 1939.